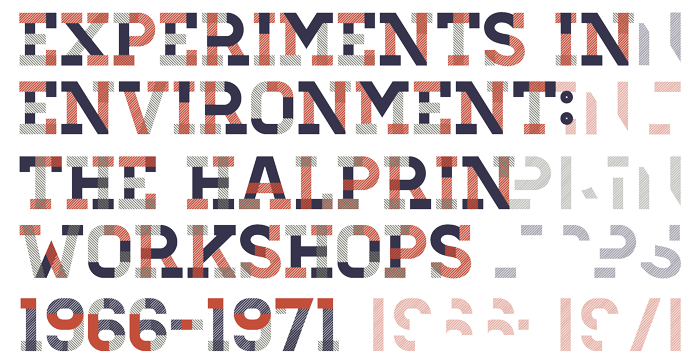 Experiments in Environment: The Halprin Workshops, 1966–1971 is on view at the California Historical Society from January 21 - July 3, 2016. Gallery Admission is $5 per person; we welcome Members and children free of charge. We do not charge for use of our Research Library. We invite you to visit the California Historical Society and explore our vibrant neighborhood. The Society is nestled within the Yerba Buena District, a dynamic downtown hub comprising more than two dozen museums; performing arts facilities, and other cultural institutions; a 5.5-acre park; restaurants; hotels; movie theaters; shopping; and one of the most heavily used convention centers in the world. It is a destination for locals as well as tourists and has been hailed as a major cultural hot spot of San Francisco. Fifth & Mission Parking Garage, Fifth and Mission Sts. St. Francis Place Garage, 1 St. Francis and Third Sts. BART: to the Montgomery Street Station. MUNI Bus: 9X, 30 Stockton, and 45 Union travel south on Fourth Street; 9X, 15 Third, 30 Stockton, and 45 Union travel north on Third Street; 14 Mission travels east-west on Mission Street. Muni Metro: Use Montgomery Street Station. Golden Gate Transit: 70, 73, 80 to Mission St. and 3rd St. Call 511 or visit 511.org for more information. From the Peninsula: Highway 101 North or Highway 280, use Seventh Street off ramp, go north on Seventh and turn right on Mission Street. From the East Bay: Bay Bridge to Fifth Street off ramp and north on Fifth Street, turn right on Mission Street. From Marin County: 101 South (Golden Gate Bridge), proceed on Doyle Drive (Marina) to Lombard Street, turn right on Van Ness Avenue, turn left on Eddy Street, cross Market Street, and turn left on Mission Street. Subscribe to our newsletter for weekly updates and information about History happenings across California.